Valentine’s day is just around the corner and all over the world, couples are getting ready to celebrate their couplehood by gearing up for a night that’s all candle-lit dinners, bouquets and chocolates. So if you haven’t got your act together yet, this is the time to suit up and start planning how to make your night special. But remember – not all that glitters is gold – the best ideas are usually the ones that aren’t necessarily the most expensive, but the ones that let your partner know that they’re on your mind. * Adding a romantic picture to your QR Code turns it from a Valentine mishap to Valentine success. Let your loved one feel all warm and mushy inside by surprising them with a heartfelt Valentine QR Code that will lead them to a YouTube video of the song playing when you first met or a special note of love. This is especially useful if you’d like to pour out your heart privately but give your card in a public setting. 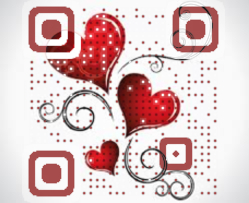 * Titillate your darling with a thrilling game of romance by leading them around them house with Valentine QR Code clues they can scan to get various messages and directions. It’s just original enough to score you points for the thought and simple enough to execute with very little effort. So why wait any longer? Pick your sweet method of choice and get down to business! Have an especially melting Valentine QR Code you want to share? Let us know in the comments below or post on Visualead’s Facebook page.